When you are faced with the trials of life, there are just two choices: Navigate the storm on your own, or allow others to make the journey with you. That’s what our Care Ministry is all about. Whether you are caring for a relative suffering from Alzheimer’s Disease, dealing with the recent death of a loved one, battling an addiction, or grieving the loss of your marriage to divorce, we can help you move from hurting to healing. If you need support, we are here to help. Simply email. month, we share a free meal together at an event called TNT. Won’t you join us? 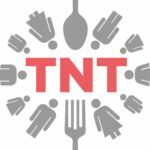 Learn More about TNT here.